Conform boned figures to other boned figures. Finally make your Poser clothes behave! Conformer in Cinema 4D is an expression tag that allows you to conform one boned figure to another. The initial goal was to allow Poser confoming clothes to work as expected in Cinema 4D, but it has evolved into a more generally useful tool. Use is simple. 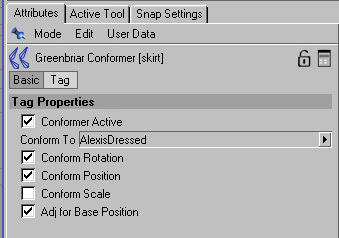 You add the expression tag to the object that you want to follow another objects motion, such as a piece of clothing. In the tag interface you just grab from the object manager the figure you want to conform to and drag it to the Conform To field in the tags properties. Once the Conform to figure is selected you can turn the options and the active status on and off as you like. With this version of Conformer, you can even drag around the conformed items without having to deactivate it! Conform Rotation - All bones in the figure will follow the rotations of the bones in the Conform To figure. Conform Position - All bones in the figure will follow the positions of the bones in the Conform To figure. Adj for Base Position - Very Useful! This switch lets you turn on and off whether the system adjusts for the difference in starting positions of the two figures (Poser is basically always on). If it is on, the figures will snap together and stay together, no matter where they are located in the scene. Makes things easy, but what if you need to shift the clothes slightly? You cant, they just move back. If you turn off this switch, you position the two figures in the relationship you want and they stay that way! You can have something stay by the side of a figure, two figures side by side, clothes moved up or down a little, but move the Conform To figure and everything moves right with it. Experiment with this, it is a very powerful feature. The most complex part of this sysetm is with the rotations, since most clothes do not have all the bones of the Conform To figure. Conformer works correctly with any figure that has any subset (or subsets) of the Conform To figures bones, but they must be parented the same! This is the one gotcha. Bones rotations are defined as the rotation from the parent. If you change the parent the rotations can change radically and applying them from one figure to another mis-parented figure generally makes a mess. Most Poser clothes designed to be conforming have all of a Poser skeleton, or have a poser skeleton with uneeded parts dropped off. These are not a problem. But we have found a couple where bones were dropped in the middle. An example - a skirt with thigh bones and a hip bone, but no buttock bones in between, the thighs were parented ditrectly to the hip, so the skeleton sections dont match. Fortuneately, if you run into one of these, there is an easy fix. Just unparent the bones that are mis-parented. Conformer was written so that it can handle early ends of chains of bones, including multiple ones in a single figure. It hits the unparented bone, sees that it matches a parented bone on the Conform To figure and recalulates how to adjust it. 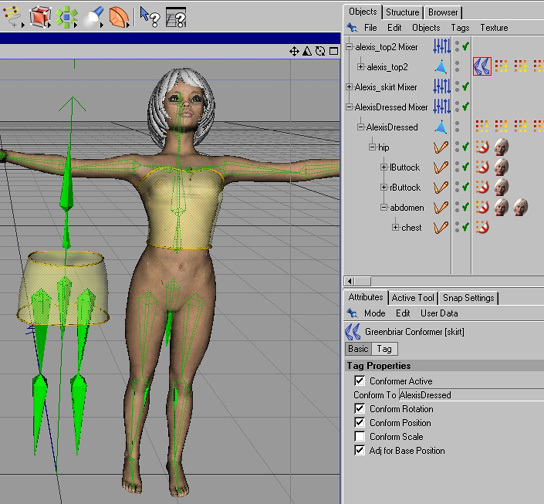 Alexis fairy figure showing the top conformed to the figure with the Greenbriar Conformer expression tag. The top is not only tracking position with the figure, but bending backwards with it as well. The skirt is not yet conformed - it stayed where it was when I moved the figure.